Shot with a GoPro, my iPhone 4 and created in Windows MovieMaker. 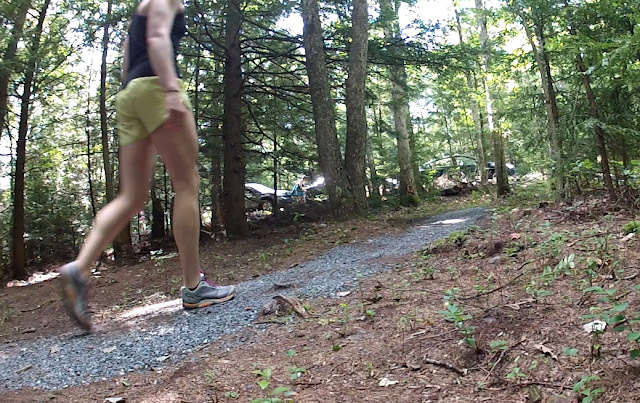 I wear minimalist shoes for just about everything active these days, which can make the transition to burlier more stable trail running and hiking shoes uncomfortable. Though I normally associate Teva with sandals I wore as a kid, I was excited when they reached out with a chance to test a new, innovative line of trail shoes. In an effort to find a balance between unsupportive minimalist kicks and stiff, overbuilt traditional shoes, Teva created the TevaSphere collection. Among that collection are the TevaSphere Trail eVent cross trainers, which I tested in beautiful Pennslyvania forests, on hiking trails, on short trail runs and more, as illustrated in the video. Right out of the box, it's obvious the TevaSphere Trail eVents aren't your typical trail shoes. Designed for participation in non-traditional sports like obstacle courses, mud runs and adventure racing, the shoes feature TevaSphere technology with the goal of providing support and allowing for a more natural stride. The spherical heel is designed to mimic the actual shape of your foot, allowing for a more natural point of impact and transition. 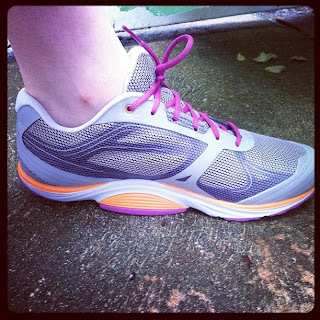 Traditional athletic shoes have squared-off heels and over-cushioned insoles, which is part of what prompted me to transition to minimalist kicks in the first place. The pod-arch support system is one of the most unique (read: weird-looking) features of the TevaSphere collection. The pods are positioned right under your foot to prevent ankle rolling and to provide support where we need it most. Learned on this trip to Lehigh Gorge State Park, the GoPro takes pretty decent pictures! How did the TevaSphere Trail eVent Shoes fit? The uppers were initially stiff and uncomfortable, but the more I wore them, the more they softened. There's too much room in the toe box overall for my feet, but they're perfect width-wise. I was surprised to find little arch support in the insole, given the emphasis on arch support with the pods. I considered replacing the insoles, but decided to give them a chance. They ended up being comfortable on hikes and trail runs alike, though to be fair, I'm more of a hiker than a trail runner. I was worried the support pods would get in the way, but the shoes are lightweight enough (9 oz) that I didn't feel bogged down and hardly felt the pods at all while hiking and running. Does the eVent waterproof fabric and Spider 365 rubber work? Waterproof shoes are great for hiking as long as you don't intentionally or unintentionally submerge your foot completely. While rock-hopping at Glen Onoko Falls in Pennslyvania, my feet stayed dry until I let water run over the top of the shoe and on to my sock. The waterproof membrane actually prevented my feet from drying, which made for an uncomfortable hike. I'd rather a design like the Columbia Powerdrains, or a super quick-drying material for situations like that. I don't typically wade through bodies of water when I'm hiking, but you never know. The Spider 365 rubber did seem to work well to keep me from slipping when the shoes and terrain were wet. Most importantly, did the TevaSphere Trail eVent shoes live up to the hype? Overall, I'm impressed that Teva designers really seem to be thinking outside the box with respect to hiking and trail running shoes. The entire line includes shoes for a variety of pursuits; it's not as if Teva designed a hiking shoe and left it at that. The support pods did make me feel more stable hiking on uneven terrain and I definitely plan to wear them again for hiking. For running, however, I'm more partial to a minimalist shoe. Even the minimal design of the TevaSphere Trail eVents was too much, though they're closer to what I'm looking for than other traditional trail shoes. Bottom line? If you're into obstacle courses, trail running and hiking, but need some additional support, the TevaSphere Trail eVent shoes could be perfect for you, even if they're not perfect for me. Many thanks to Teva for providing a complimentary pair of shoes for testing and a GoPro to shoot video with! What do you think, would you give the TevaSphere line a try? Or are they just too non-traditional for you? Leave a comment! Also, use the code "TSBLOG-PAYG-KCLC-AGPK-ING4" on Teva.com to save 15% on your own pair of Tevasphere shoes, thanks to Teva! Code expires on August 31, 2013.